When Hurricane Harvey pummeled Houston more than a year ago, it took out countless homes, roads, and businesses. It also devastated one of Houston’s greatest cultural gems: the Downtown Theater District. Though all five performing arts venues were flooded, one building had noticeably more damage than all the others, remaining closed for over a year. The Wortham Theater Center is home to the Houston Grand Opera, Houston Ballet, Da Camera, Society for the Performing Arts, and many other smaller performing arts companies. Like many Houstonians, they were uprooted by Harvey and faced with challenges they never expected. But in the spirit that reflects the city they represent, all the arts groups persevered and rebuilt. Building repairs cost approximately $100 million and the loss of revenue from the unprecedented season will impact the performing arts companies for years to come. By some estimates, it will be another three years until the groups are fully recovered. But after 229 canceled or rescheduled performances, 12 feet of water, and $100 million in renovations, the Wortham Theater Center is finally back in action. Members of Houston Grand Opera, one of the venues resident performing art organizations, reflect on the unusual and unprecedented year away from home. With their home theater out of commission, Houston Grand Opera scrambled to find a suitable replacement venue for their 2017-2018 season. Because of scheduling conflicts, as well as the specific needs of a full-scale opera production, no other space was able to accommodate the company. They decided to construct Resilience Theater inside the George R. Brown Convention Center as a temporary structure that would enable them to continue their season until the Wortham reopened—something they hoped wouldn’t take longer than a few months. The fluorescent lights, 20-foot ceilings, and stadium seats didn’t quite create the theatrical ambiance most opera goers are used to. However, Houston Grand Opera felt confident that they could make do in the new space until Christmas. But as the Wortham’s reopening date kept getting pushed further back, the company recognized they may be away from their home longer than originally anticipated. “All year it was a day-to-day process of figuring out as we went and solving each problem as we hit it,” says Molly Dill, producing director for Houston Grand Opera. “When we realized we weren’t going to be in the Wortham, we had to start thinking through the impacts on rehearsals and performances.” Opera companies normally plan their performances and book artists years in advance. They have every detail—from rehearsals to production logistics—mapped out months before the season even begins. The Resilience Theater met the opera’s location and spacing needs, though the company would come to learn more about the specific obstacles of performing in a convention center: the automatic timers on the lights, escalators that would quit running on some mysterious schedule, and height limitations for much of the scenery. Not to mention, the Opera suddenly didn’t have access to all of the basic amenities that come with a theater venue. It meant thinking through every detail of every step for rudimentary needs they had previously taken for granted. In addition to adjusting to the makeshift space, the company ran into another problem: they had no idea if they’d be able to stay in the George R. Brown after winter. Houston First, the company that owns both the Wortham and George R, Brown, had conferences booked in the exact space where Houston Grand Opera constructed their temporary theater. In the end, it all worked out. “Houston First did heroic work to rearrange their schedule and all the conferences,” explains Dill. Though the Wortham remained closed for an entire performing arts season, construction crews worked around the clock to ensure the looming deadline for 2018-2019 fall performances would be met. With much fanfare and excitement, Houston First officially reopened the Wortham on September 25, welcoming back stage crews, ushers, singers, dancers, and all those who call the Wortham home. “I don’t think anyone will ever know the miracles the stage crew, the design team and the construction team pulled off in a short amount of time,” says Sheila Turkiewicz, chief operating officer of Houston First’s Theater District operations. With the amount of flooding and damage done to the massive building, many in Houston speculated if the fall reopening date was even feasible. But Houston Mayor Sylvester Turner and other city officials were instrumental in the recovery process. “Not getting back for this season was just not an option,” Turner said at the Wortham’s grand reopening event. He equated the struggle to get back into the theater with the challenges many across the city face in rebuilding their homes. The resilience is part of who we are as Houstonians. “We knew we would get back, because that’s just who we are. We believe in one another,” Turner reflected. Congresswoman Sheila Jackson Lee, also present at the event, agreed that the city had an obligation to reinvest in the arts. It is a place where Houstonians from all walks of life can experience some of the best art performances in the nation. “Bar none, I believe the Wortham is one of the greatest theaters that one could ever have,” she proclaimed. 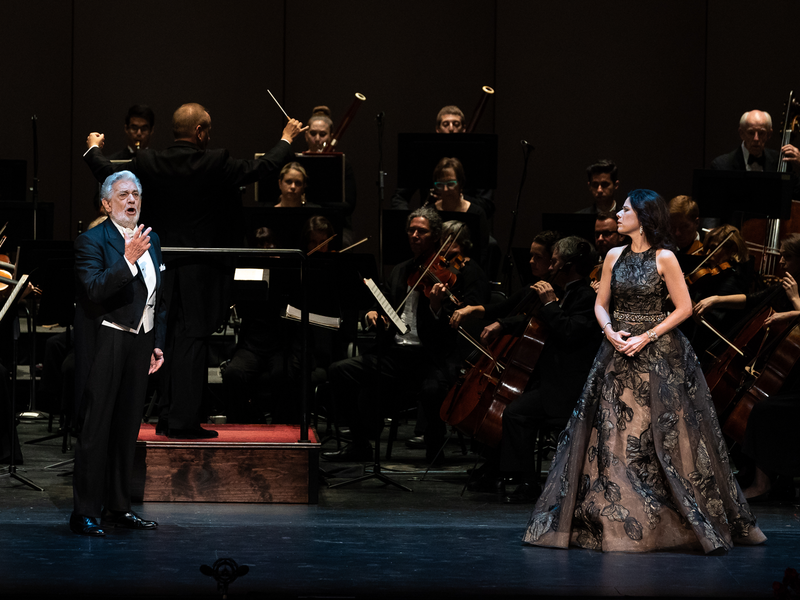 The first performance back in the Wortham was the opera’s sold-out presentation of celebrated tenor Plácido Domingo on Sept 26. Though performances are able to take place in the building once more, the hurdles are far from over. “We’re going back into a building that was seriously damaged and still recovering. It’s still in progress. We know there may be some surprises in store for us when we get back,” says Dill. For Houston Grand Opera, the building is truly a home. Like others who were dislocated during Harvey, finally returning after so much time away was an emotional experience. “It’s the idea of the Wortham that’s special to me. It’s something that HGO took part in building. It’s just our home,” Dill explains.